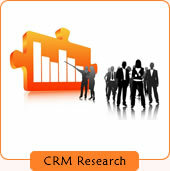 Analyst firm Forrester predicts the CRM software market for software and services will reach over $15 billion by 2014, up from $8.4 billion in 2007. The company's research cites several factors which collectively drive increased spending. Companies are placing an emphasis on driving growth by attracting new customers and selling more to existing customers. They're also investing in CRM software to boost user productivity of customer-facing workers, push service-oriented architectures (SOAs) and improve the customer experience and relationship. A supporting survey by consulting firm Accenture of Chief Executive Officers found that their top four CRM software priorities were acquiring new customers, increasing customer loyalty and retention, increasing revenue from existing customers, and increasing customer service capabilities. According to analyst firm Gartner estimates, the CRM software market totaled about $11 billion in 2012, and about one-third of that came from software as a service (SaaS) CRM systems. Gartner forecasts the overall CRM software market to grow at low double digits, but the SaaS slice of the CRM pie will grow at more than twice that rate of on premise CRM software. There are also expectations that the CRM industry will reach some natural limits to growth and that an economic downturn will cause customers to cut back a little on CRM spending. However, even with slowing growth, the figures are substantial and represent nearly a doubling of the market over the next six years. Gartner's totaling of the CRM industry software sales includes annual sales for perpetual software licenses as well as on-demand CRM applications delivered through the SaaS model. "The sustained performance of major on-demand solutions providers is driving the growth in the SaaS segment," explained Sharon Mertz, research director at Gartner, in a statement included with the forecast. "As businesses refresh existing sales force automation systems to align with their renewed drive for business and revenue growth, we expect this to push sales software to become the largest CRM subsegment. Forward momentum will return to the market as buying decisions become clearer and customers undertake platform migrations to service-oriented architectures. Increasing demand for analytics, marketing automation and a focus on SaaS solutions will also drive growth during this time. Buyer application selection will continue to focus on areas showing rapid return on investment in all CRM subsegments." A Datamonitor report included findings and projections of several interesting elements. Global SaaS CRM market will grow at high double digits. CRM software spending by enterprises with fewer than 1,000 staff accounted for one-third of all software licenses sold. That sector is now projected to account for over 42% of the market. Because of their reliance on subscription revenues and service capabilities, the Telecommunications, Energy and Utilities and Financial Services industries will remain the heaviest investors in CRM technologies. It is also expected that CRM investment by the Healthcare, Public Sector and Life Sciences industries will exceed the rate of growth in the Telecommunications sector. This is driven in large part by the adoption of a customer-oriented approach to public sector services and the relative success of applications supporting a relational, not transactional, approach to customers. The leading on-demand CRM vendors will find themselves under increased pressure both from smaller hosted solution providers and established on-premise vendors offering on-demand software versions. The implications are that subscription prices could decrease, particularly among the less-differentiated entry-level solutions. “Vendors offering on-demand CRM solutions will differentiate themselves by investing in advanced feature-sets, data-center hosting efficiencies and by integration with their own on-premise versions of CRM so that their customers will be able to seamlessly migrate between the same vendor’s hosted and more traditional editions,” said Vuk Trifkovic, Datamonitor analyst and author of the study. CRM and enterprise software analysts always seem to come up with specific market measurement and forecast figures. However, analysts can also be elusive when challenged to support the sources for those figures or stand behind their forecasts. A Forrester forecast publicly published claimed that CRM revenues will skyrocket to $74 billion, made up of approximately $21 billion in software applications sales and $53 billion in services sales. The report went on to state related implications such as a serious shortage of CRM skilled workers in the market place. However, a comment later made by Forrester suggested that the forecast was "not approved for use" even though it was widely distributed. Whether analysts responses such as this are an attempt to backtrack or simply earn revenue for more official statistics is a guessing game that has left CRM software buyers perplexed for years.